Natural Impulses at Locks Gallery displays the talents of four artists: Nancy Graves, Alyson Shotz, Hilary Beserth, and Maria Nepomuceno. Exhibiting a combination of paintings, small sculptures, and larger installation pieces, it engages with the idea of the interplay between nature itself and the human element. Immediately noticeable are the works by Shotz, who is inspired by natural forms, patterns, and evocative shapes related to nature, creating paintings, prints, and sculptures that delve into the intersection between nature and humanity. 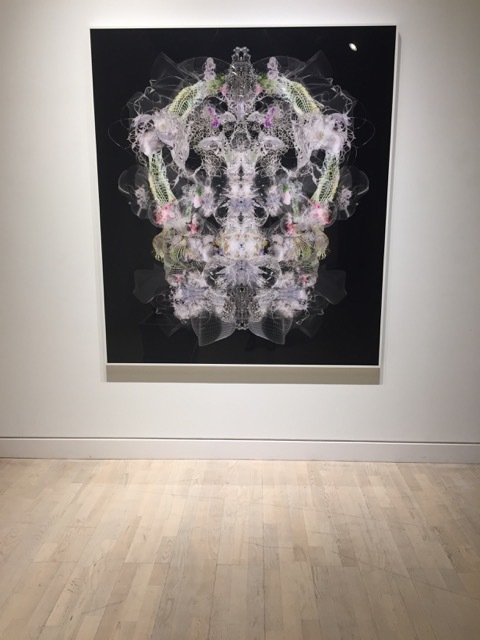 A highlight of the show is Coalescent, a print on black ground which looks like an x-ray of a human skull from far away – up close natural forms like helixes, flowers, and gossamer spider-webs come into view, all perfectly reflected by one another across a central vertical line. The bilateral symmetry referenced in Coalescent is a phenomenon commonly found in nature, and even as it looks rather fantastical and artificial the work effectively references the inspiration of nature. The fact that the forms contained within resemble plants, while at a distance the work looks like a human skull is a keen commentary of the intertwined relationship between nature and humanity, implying that humanity itself is built upon these delicate natural elements. Other works by Shotz that stand out in Natural Impulses are her large-scale installation pieces – Untitled and Still Life – which resemble massive plant stalks topped with leaves. Considering the media these installations are made up of—rubber, latex, steel, tape, tubing, et al—immediately draws attention to the artificiality that went into creating such natural-looking forms, also indicating the human element, in this case the hand of the artist herself. In contrast to Shotz, Hilary Beserth’s small sculptures flip the script. Made of natural metals such as copper and nickel, works like Plated Point 2 and Plated Point 5 are more artificially shaped and sculpted. Programmed Hive Eleven puts its media of beeswax and wood to great effect as a work that references nature as its material. The sculpture incorporates the element of scent in its display with its sweet, subtle wafting smell, and references the idea of labor and work, if only that of bees in their hives and not necessarily the work of humans. The mere fact that the artist is using materials found in nature to create her work suggests another take on the relationship between humanity and nature. If Shotz argues that humanity is built upon nature and manipulates the manmade to approximate it, then Beserth replies that humans interact with nature in a more direct, hands-on way by using beeswax and wood to create more abstract forms. 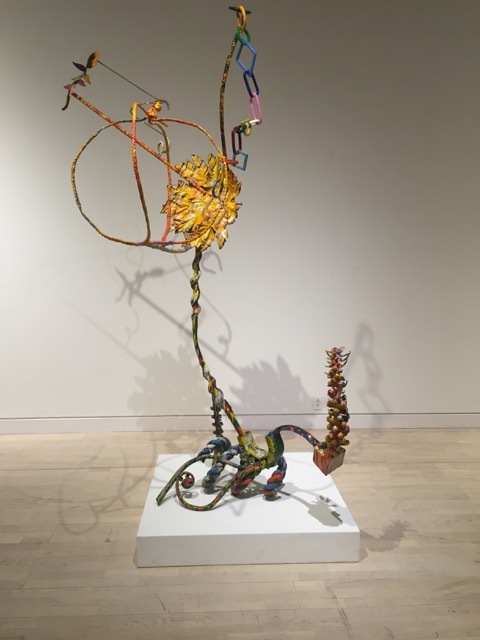 Nancy Graves’ works in this show are several sculptures, made of bronze with colored patina, enamel, and/or paint on bronze bases. They depart the most from nature, perhaps arguing the primacy of humanity and the man-made over the power of natural forms and materials. If Beserth is the most in tune with the natural in terms of material, and Shotz in terms of form, then Graves is the human element itself as she abstracts various natural forms and attaches them to one another in unexpected ways. 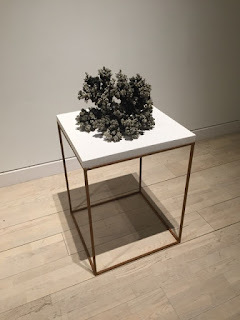 The mere fact of her choice of bronze as a medium, a man-made alloy created from copper and tin, suggests that her idea of “natural impulses” is largely human-centered. Whiffle Tree contains forms that appear to be derived from animal skeletons, while Etruria has forms like an animals protective shell, along with forms approximating leaves and plants all stacked vertically. 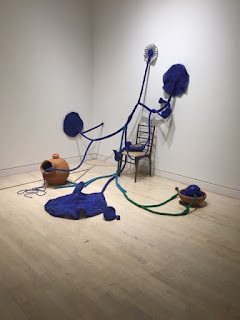 Maria Nepomuceno’s work Untitled was perhaps the hardest to parse through. In a room full of works that are inspired by the natural, what are large skeins of beads – albeit ones in the shapes of plants – and a chair doing here? Since it is located diagonally across the room from Shotz’s human-impacted works, it seems that Nepomuceno is taking the human element of the natural world one step further, showing how humans turn the natural into objects for their own use. Natural wood is turned into a chair, clay is turned into a vessel, and plants are carefully arranged, even as they try to climb the walls. Overall, Natural Impulses engages both the natural world and the artifice of humanity in satisfying ways, both overt and subtle. 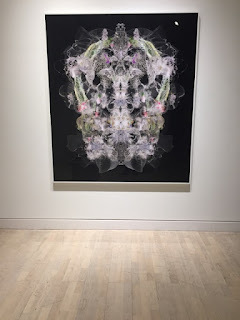 Through material, form, and subject matter, the works in this show engage with and balance out organic and artificial elements and excellently highlight the various interactions between humanity and nature, depicting the impact that one leaves upon the other.